Here's a little instant gratification project. I've been wanting to make this for a long while and fell in love with it the first time I'd seen it. Get yours here at Crochetroo's Blog for FREE! Here's a last minute decision on a WIP. Its the Isabeau Purse. So far, so good! Lets hope this doesn't end up becoming a frogged mess out of frustration. I've been working for a couple of months of my cable scarf, and after a scary accident of dropping stitches and stuff, I finally learned how to put the stitches back on my needle and I'm back on my way to stitching! 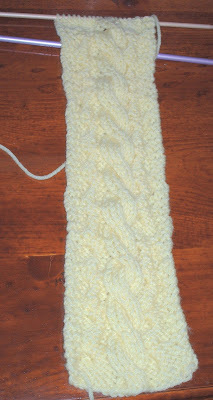 I'm not a very fast knitter, so dont laugh when you see the length of the scarf! (teehee) Actually, i'm just learning to Knit and am extremely proud of what i've accomplished so far! And its a Cable scarf to boot!!! woot woot!! ......................And now, here's a project I found while browsing the Lion Brand website for Beginner patterns. I really like this sweater, but I think even tho its labeled as beginner, it may still be way to over my head. I dont know, i'm still thinking about trying it anyways so wish me luck!!! Anybody else made this yet?